Our friends Zak and Becky Alwin perform in their original hip-hop style as “Rhymz Suhreal”. I’m excited that I got to help with the launching of their new web site at www.thebandRS.com. But I’m even more excited about their new music video “Waves”. The video speaks about how we can get caught up in circular patterns of destruction that pull us back in like riptides in the ocean. It ends with Zak still in a hopeless state, but the Alwins have created a discussion guide that can be used to introduce people to Jesus, the “circle breaker”, who can set us free. Check out the “Waves” video, the “Behind the Music” video, and the discussion guide at www.thebandRS.com (click on the 3 lines at the top left to open the menu). This entry was posted in Online Resources, Prayer Letters on July 1, 2015 by Karl. My name is Balazs, I’m from Hungary, and I’d like to share my story of how I became a Christian. One day last summer, I was at work and surfing the Internet. 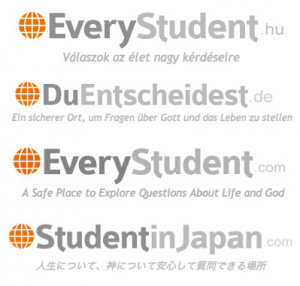 I saw a banner, saying “Six straightforward reasons to conclude that God exists.” It looked interesting, so I clicked on everystudent.hu. That thought was hilarious. I wanted to test it. So I clicked. Needless to say, nothing happened. But there was a box where I could ask questions. I had tons of questions. I started to correspond with a volunteer on the site. After a few months we met in person, along with her family, and we became friends. After a while, I ran out of questions. I accepted Jesus, not by clicking on a link, but by heart. What has happened every since? God has made his presence known in my life in many, many ways. First and most importantly, the painful feeling of missing something in my life is gone. Now, I’m a volunteer on everystudent.hu myself. I’m answering questions for others. If it wasn’t for the digital means, I probably wouldn’t be a Christian. I never really trusted religious people, but a website seemed harmless enough. I know that many people around my age (26) feel the same. Thanks for reading, God bless. Marilyn Adamson, a fellow Cru missionary, started www.everystudent.com in the fall of 2000. Now it’s available in 40 languages, and God is using its various versions to draw people to Himself from every area of the world. It’s a privilege to have helped Marilyn in little ways over the years and to be serving with a ministry like Cru that is using digital technologies in life-changing ways. This entry was posted in Online Resources, Prayer Letters on May 28, 2015 by Karl. a social media campaign that can be used by Cru movements across the country! Each week project students and staff participated in at least two outreaches on social media, through social justice, or by initiating conversations on a local college campus using an art and belief survey. On campus, Karen and Stephen talked with Nick. He was very open to taking the survey. As they talked, Nick said he is bothered by street preachers who yell at people through megaphones. Karen and Stephen established common ground when they said they didn’t prefer that method either! Nick was open to going through four points about knowing God. When we return the time, talents and resources God has given us to Him, He “takes our open hands” and uses them for His glory. Thank you for your prayers and gifts that keep ministry like this going! This entry was posted in Online Resources, Prayer Letters on September 26, 2014 by Karl. David Pendleton, Keynote comedy ventriloquist, has recently been touring the Midwest with his cast of comedic characters: Aunt Tilly, a lovable but blunt 94-year-old spinster; Mack Elroy, the classic, quick-witted troublemaker; Buford, the dopey yet adorable hound dog; and Vern, the slightly misguided albino vulture. Making people believe that “anything can talk” is not the only thing that has kept David busy. I (Karl) had the privilege of helping to work on the new site. I and my coworkers Ryan and Karen made sure that the site looks good on different devices like phones and tablets. We learned things about David’s ministry that we’d never heard – check out the inspiring story of how he acquired Mack (it’s a bit hidden – click on “Bio” and then Mack’s icon at the bottom). Your partnership with Keynote helps start spiritual conversations in creative ways. Thank you! This entry was posted in Online Resources, Prayer Letters on June 4, 2014 by Karl. You can do more than just watch this year’s Winter Olympics! 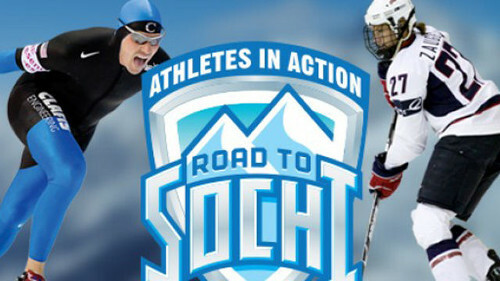 Athletes in Action, Cru’s ministry to athletes, is planning fruitful ministry around the 2014 Sochi Olympic Games. While you might not be able to attend the Olympics, there are plenty of ways for you to be a part of the ministry. AIA is enlisting people to serve as Olympic Prayer Partners for the 2014 Sochi Games. Each person will be assigned the names of 3-5 Olympic athletes to pray for during the weeks leading up to and during the Games. You can then take each specific athlete before the Lord and ask His blessing over their Olympic experience, His provision for their physical health and safety, and His dominion over their spiritual lives as they have the opportunity to encounter the various chaplains and ministry personnel who will be present at the Games. AIA leaders and staff representing over 10 countries around the world will be ministering to Olympians. AIA staff will have direct access to the athletes while acting in unique positions in Sochi: chaplains, advisers, counselors, coaches, trainers, and other administrative positions. Look for these athletes in Sochi, and check out their stories of faith at www.beyondtheultimate.com. also, see the story of Paralympian Bonnie St John. You can also follow AIA on facebook and twitter. We hope that you’re inspired to pray, and perhaps are able to share some of these stories with your friends who haven’t already decided to follow Christ. This entry was posted in Online Resources, Prayer Letters on January 30, 2014 by Karl.